The city of New York will choose Nissan as the supplier for the next generation of taxi cabs, giving the Japanese automaker an exclusive 10-year contract for the city's fleet of 13,200 yellow people haulers. 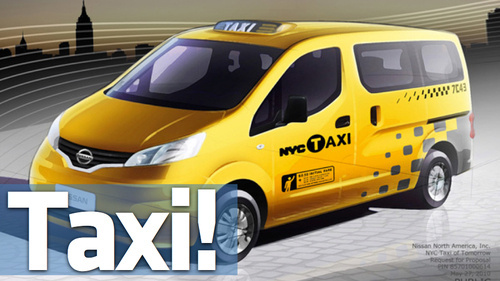 Click here to read our first drive review of the new Nissan New York City taxi's big, rear-wheel-drive commercial cargo-carrying brother, the 2012 Nissan NV van. According to the New York Daily News, the Nissan design beat out the Ford Transit van and a design from Turkish builder Karzan, based on durability and interior specs. The win means Nissans will slowly replace the Ford Crown Victorias and hodgepodge of hybrid Ford Escapes and other assorted vehicles bought by taxi firms and used to brainwash New Yorkers with Sandy Kenyon's celebrity ramblings. While the Nissan's van bears a resemblance to its big NV commercial line in America, it's actually based on the smaller NV200, a model Nissan sells in Europe and Asia. The city's pick has some controversy; the Karzan V1 design won a public poll, while taxi company owners preferred the Ford Transit Connect given their experience with knowing how to fix Crown Vics and their supposed lower price point. This is likely a big loss for Ford, which had hoped to anchor sales of the new Transit Connect with a winning New York City taxi bid. It's also no win for "buy American" advocates; none of the three competitors are currently built in the United States — Nissan assembles the NV200 in Spain and China — but then again, the once-dominant Crown Victoria was a Canadian import.